Our range provides an economical and comfortable heating solution that warms you and your towels. Available in stylish modern and traditional ladder designs, to our top of the range designer electric towel radiators with intelligent timers, programmers and thermostats. Available in both modern and traditional styles, our luxurious towel rails are top of the range and employ the most up-to-date technology. If you need help with your selection, please call us on 01473 276686 and one of our technical team will be happy to help you. Alternatively, you can view our full range of Towel Rails & Radiators. Heater Shops electric heated towel rails and radiators offer the most control over your bathroom heating. In summer when central heating is reduced, an electric towel rail works independently to continue emitting heat efficiently. Many are fitted with an accurate electronic thermostat which will automatically regulate the heater’s output. The best way to warm your bathroom or wet room’s towels, Heater Shop’s selection of towel rails offer a touch of class as well as an effective storage space and heat solution. Our electric towel rails are available in a variety of finishes from white to black graphite and metal chrome towel rails - our luxury and low cost products offer the best available electric heating for your towels in your bath or shower room. 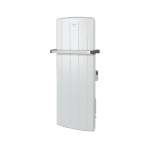 They provide energy efficient electric heating that can be controlled independently from the rest of your heating, with the best heated towel radiators offering smart instant Wi-Fi control via an App installed on your smart phone or tablet. Several of our models offer different pre-set modes such as anti-frost, eco and comfort mode. They are fireproof and waterproof with an excellent IP rating. Many offer a backlit screen displaying information such as personalised settings and current ambient room temperature. Many of our products include instructions and an installation template which will come supplied with your product but are also available in the installation tab on each product page. Our step-by-step guides will help you select a suitable position for your wall mounted radiator and ensure a user-friendly setup experience. however, if you are not comfortable installing this product, we would recommend that you use a qualified electrician. Smaller bathrooms could be satisfactorily heated with only a large towel rail; larger bathrooms, depending upon their insulation and location, you may need an additional heat source. However, when using another heater in a bathroom or shower room, you must ensure that you use a heater which has an IP rating which is suitable for wet rooms. See our guide to IP ratings for more information. An advantage that electric versions have over simple steel towel rails and rings, is that there is no need for the rail to be connected to the water mains and can be separate from your central heating system. Electric models also do not require rust-inhibitors. Most of our models use an oil or a water-glycol filament allowing them to react quickly, however we also offer dry element options. With little or no installation cost and the total control it can offer, there is the opportunity for you to save money. The thermostatic control allows for scheduled heating periods, reducing overall running costs. Size and design are very important factors. For help selecting your the towel radiator suitable for your room, call and talk to one of our helpful representatives on 01473 276686. The design is very much your own preference, be it coloured rail, ladder towel rail, traditional or full panel heaters. We would suggest that you take your time reviewing our wide selection as well as investigating the product’s capabilities such as WIFI control or its energy saving functions. Thank you for the great review of our service.